REKKVERK is a hard rock band from the Greater Reykjavik Area, Iceland. The band members have all been involved in music on and off for over 20 years, but the band´s history spans several years. 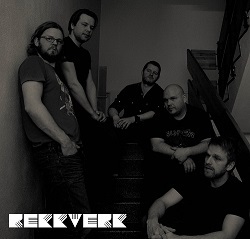 REKKVERK started mainly as a cover band playing a broad variety of rock songs but in the year 2009 the band shifted towards making their own music. It created challenges for the band members due to their mixed background in rock, metal and pop, which gives the band its unique flavor. Even though the band member’s background is different, all of them love loud guitars and heavy drums. The main influences are from bands all over the music genre, such as the Foo Fighters, Pantera, Mastodon, TOOL, Deftones, Faith No More and many more. REKKVERK has released 3 demos so far with many more to come. Helgi (vocals), Steini (drums/back vocals), Gusti (guitar/keyboard), Einar (guitar/back vocals) and Joi (bass/back vocals).